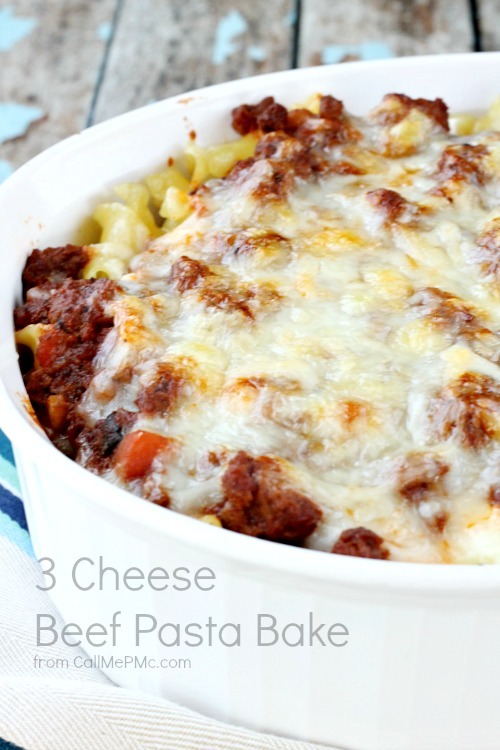 Convenient and tasty Three Cheese Beef Pasta Bake is sure to become a family favorite. 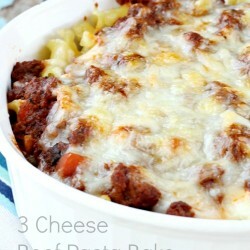 Layers of hearty pasta, gooey cheese and tomato meat sauce is baked until golden brown! Pasta with a tomato sauce is one of my favorite foods. When it comes together as quickly as this one does, well, that’s even better. 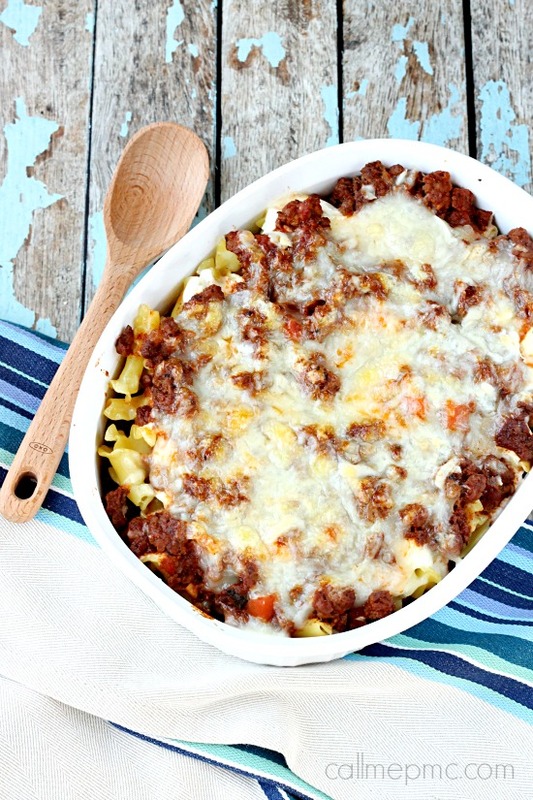 I used a jarred sauce in this Three Cheese Beef Pasta Bake recipe. Find a good quality sauce and it’ll make your life so much easier! If you follow me on Instagram, you know I received some Barilla products recently. I could not wait to start cooking with them. Pasta, I can confidently say, is my most favorite food. Seriously, I could give up meat easily. Heck, I could give up my beloved desserts, but I could not give up pasta! 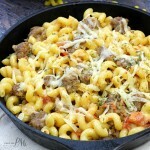 I love this pasta recipe, I’ve been making it for years. I also love the short cut of using a jarred tomato sauce. You can taste the difference of Barilla® Sauce because it’s made with real vegetables. It has all natural, quality ingredients like vine-ripe tomatoes, extra virgin olive oil and fragrant herbs. 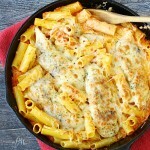 I like to use fun pasta shapes in my casseroles, but you can use any shape you like or have on hand. Today I used Campanella! In Italian Campanella means little bell, or shaped like a bell or flower. They are like perfect for capturing meaty sauces. Another bonus, I make this pasta in the morning, because all heck breaks loose at my house after the boys get home from school! Then all I have to do is pop it in the oven and in 30 minutes we have a hot dinner. I have virtually nothing to clean up after dinner as well! 1/2 pound Barilla Pasta any shape will work. This will be about half a box. Cook pasta according to package directions to al dente. Toss with oil and spoon into a greased 9x13 inch baking dish. Cook ground beef, onion and garlic in a skillet until no longer pink, usually 5 to 6 minutes. Drain and return to skillet. Add spaghetti sauce, beef boullion past and tomato paste and bring to a boil. Reduce heat and simmer 10 minutes.Stir in salt and pepper. Combine ricotta, 1/2 cup parmesan, 1/2 cup mozzarella and eggs. Spoon over pasta. 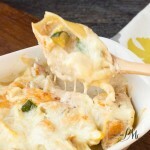 Sprinkle with remaining parmesan and mozzarella. Bake, uncovered, at 350 degrees for 30 minutes until hot and bubbly. 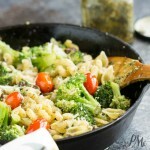 This pasta would be great served with a crisp green salad! Thank you for the wonderful recipe! I made this tonight and it’s delicious. This looks and sounds so yummy, however does anyone have a suggestion on what to substitute the 1 cup fresh Parmesan cheese, grated? I was thinking 1/2 cup more ricotta and 1/2 cup more mozzarella. I hate to change someone else’s recipe, but just can’t do the parmesan cheese, but I always make sure it is on my table so anyone can add it to their own serving. Thanks for sharing. i made this for my kids and couldn’t believe how much it made. 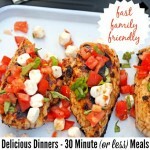 My kids loved it, all 3 of them and they even asked for seconds, which is rare with my picky bunch(3, 6, 8). I used diced tomatoes and I couldn’t find the beef boullion paste, so I just used boullion cubes mixed with a little bit of water. It was so good. I will definitely be making this again. Thanks so much for this recipe. Thank you so much for telling me, Geri. My boys love it too, they want it every week. Pasta is my favorite. I made this for dinner tonight. Super easy and very tasty, thanks for the recipe! so glad it worked or you! My family request it often!